Government and related organisations are responsible for holding and managing information that is critical to a country and its citizens. Public security plays a major role in this regard and governments need to ensure the protection of citizens, organisations, and institutions against threats to their well-being and to the prosperity of their communities. In addition, the role government plays in society requires high levels of security to keep digital and physical assets safe, while making them securely accessible where required. Now, how much can technology contribute to the overall security of government facilities, courts, power stations, prisons etc? In a time like this, it is a world-wide trend to use more technology instead of the traditional human observation and presence on site. Today’s government departments demand what identity management solutions provide which include the following superior service experiences, person/card not present transactions, efficient workflows, elevated security and device agnostic software. On the other hand, departments need technologies that enable them to achieve these objectives while increasing public loyalty and satisfaction. To meet the increasing challenges in the public security area, responsible public institutions and organisations can tap into their own intelligence to successfully address possible threats in advance. They can optimise their internal structures, use synergies, and carefully balance costs and benefits of their measures, by introducing cost effective security measures. The ever-changing regulations for governmental institutions have resulted in the need for more efficient public centric processes, when it comes to identity proofing. Border management and national security concerns have expanded the need for reliable and fast methods for checking credentials at border crossings, ports, airports, courts and government institutions. These facilities need to consider systems that provide advanced technology solutions for passport and ID verification as well as increased speed of processing travellers and visitors. This means that identity management solutions need to aid highly trained inspectors by flagging details that may not be visible or by finding recent criminal innovations in highly sophisticated fraudulent identification documents. Prior to granting access to information, an individual who has been cleared must sign a Security Screening Certificate and Briefing Form, indicating their willingness to be bound by several Acts of Parliament during and after their appointment finishes. Today, all this can be done by means of devices that allow for fingerprint, facial recognition and palm print to capture your information and allow for one transaction to take place. Government security is the assurance that information, assets and services are protected against compromise and individuals are protected against workplace violence. The extent to which government can ensure its own security directly affects its ability to ensure the continued delivery of services that contribute to the health, safety, economic well-being and security of South Africans. The GL300 is a hybrid verification glass door lock which supports fingerprint, RFID and password verification. 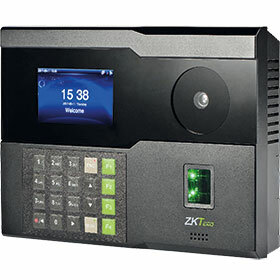 ZKTeco has created a unique range of visible light facial recognition products combined with a flexible Android platform. 43-inch touchscreen multipurpose facial recognition smart device with Android operating system. Why should educational institutions investigate the new AI visible light facial recognition technology?